Holy Name of Jesus Church was established in 1959 as a mission church of Ascension Parish located in Eau Gallie, Florida. During the first five years of its existence, the school-age pupils within the parish attended classes at Ascension School, which was staffed by the Sisters of Mercy from Ardee, County Louth, Ireland. In March 1964, the first three grades held classes in the church hall built by Monsignor Martin B. Power, the founding pastor of Holy Name of Jesus Parish. Two Sisters of Mercy, Sister Monica Ryan, Principal, and Sister Regina Sweeney conducted the classes. The following November, the first four grades moved into the permanent school building. Each year thereafter, another grade was added until grades one through eight were completed. 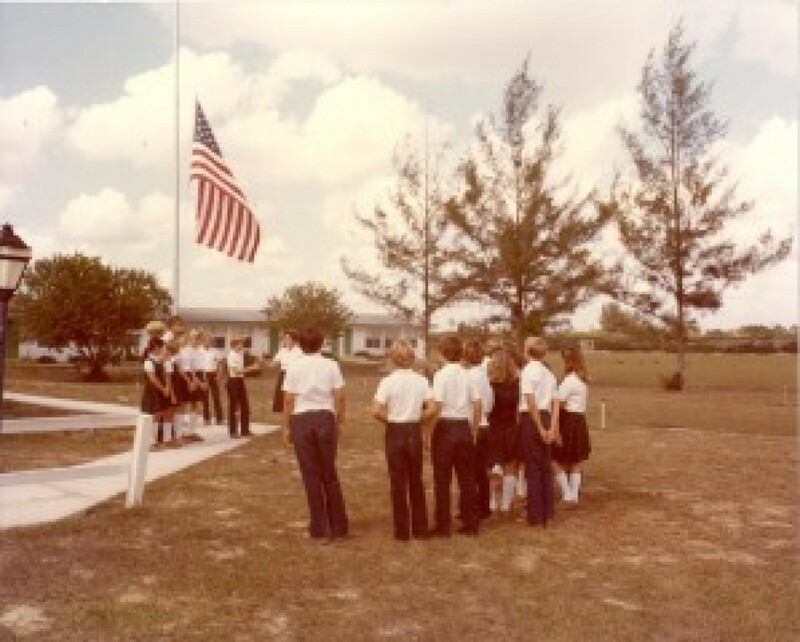 In 1965 a portable building containing two classrooms was added. During the years 1967-1971, at the height of the government's space program, the school enrollment was the highest in the history of the school – peaking at 399 during the school year 1970-1971. In 1968 two classrooms and a library were built, extending north of the portable building. A kindergarten was also started and it remained open for four years. Sister Monica Ryan returned to Ireland at the end of the 1967-1968 school year. Subsequently, Sister Rosari Carville, a Sister of Mercy from Ascension School became the principal and in June of 1969, Holy Name of Jesus graduated its first class of 38 students. Returning from Ireland in 1971, Sister Monica held the principalship through 1974. In 1974 four Adrian Dominican Sisters replaced the Sisters of Mercy. Sister Jane Quirk, the principal, reopened the kindergarten and the school received its first accreditation by the Florida Catholic Conference. Then Sisters Jan Stankowski and Ruth Ravideau became co-principals for the school year 1976-1977. Sister Shirley Hinks, an Immaculate Heart of Mary Sister, became the school's principal in 1977. She remained the administrator through the 1979-1980 school year. In 1980, Sister Rosemary Conlon, an Adrian Dominican Sister, became the principal. While she was principal, an extension to the school's permanent building was added. This extension comprised a kindergarten room, two physical education locker rooms, and a parish lounge. The library/media center was incorporated into the former kindergarten room and the previous library facility was changed to a music room. The teacher's lounge became a project room with available storage space for audio-visual equipment. Sister Kathleen Gelatka, a Sister of Charity, was the principal for the school year 1984. Mrs. Joyce Falk was interim principal for 1985. Mr. Duane Schafer came to Holy Name of Jesus School in 1986 as the new principal. During the three years he was principal the parish was involved in Vision 2000 plans which involved additions to the parish and school facilities and many renovations on existing facilities. After the first year, the office was moved into a trailer and the offices and the computer room was made into a classroom. This enabled grades three through eight to be in the same building and the music, computer, and library rooms were in the former portable classrooms on the west end of the school. Vision 2000 plans for the school included adding a new wing to house the school offices, two new classrooms, library, teacher's lounge and Religious Education office. Mr. Schafer left Holy Name of Jesus and moved to Spokane, Washington to become Superintendent of Schools for the Diocese of Spokane. Mr. Bruce Teffer became principal of Holy Name of Jesus School in 1989. A new open-air athletic pavilion was planned to be used for basketball, volleyball, parish picnics and for the annual Beachside Festival. Construction was completed in time for the beginning of school on August 20, 1990. Bishop Norbert Dorsey dedicated the new facilities on October 14, 1990. Sister Teresa Bruno, S.C., was principal in 2006 and served until 2009. During this time, the parish Life Center was completed. It contains a cafeteria and kitchen which are used for the school lunch program. The Life Center hall has a stage for theatrical productions, along with dressing rooms and a sound production room. Also built during this time was the Parish Athletic Center, which has a full-sized gymnasium, locker and shower rooms, and meeting rooms on the south side. Traffic flow patterns for arrival and dismissal for the school were changed due to the additional buildings on the parish campus. Mary Ellen Massey became principal in 2009. Six pre-fabricated classrooms that were damaged by the hurricanes of 2004 were removed, and four classrooms were turned over to the parish for thrift store storage. A regulation-sized track and field was installed behind the Athletic Center in 2010. Beginning in 2009, the school participated in the Voluntary Pre-Kindergarten program for 4 year old students. A self-contained classroom for ESE students with learning disabilities was established in 2010. The New Page Academy (NPA) contained 9 students with varying exceptionalities and different grade levels. Mrs. Mary Ann Irwin, Ed.S., was principal of Holy Name of Jesus Catholic School from 2012-17. The school has come into the "age of technology" with the total capacity, campus-wide, of wireless internet. We offer SMART Interactive White Board equipped classrooms, Mobile iPad Cart, 3D AV Rover Projection System, State -of-the-art tablets issued to every middle school student, Elementary and Middle School computer labs, Computer equipped media center, Digital Textbooks and Core Extension Programs and Digital Microscopes. Many of the textbooks and supplemental materials to support curriculum are accessed on the tablets and on websites at home and at school. Middle School students also have projects in video production, project-based learning opportunities to integrate science and math into hydroponic and traditional gardening, architecture and engineering, Service-Learning, Performing Arts, Visual Arts, Foreign Languages, 21st Century Skills, Cultural Explorations and many additional opportunities for Enrichment and Exploration. HNJ students continue to excel in Brevard County and Brevard Catholic Schools Science Fairs, Orlando Holocaust Center, Brevard County Art Shows, and Honors Choir among many other events. Mrs. Kathleen Falk joined Holy Name of Jesus Catholic School as principal in July 2017. Her experience in Catholic education began with her parents’ decision to send her to St. Genevieve Catholic School only to become a teacher there and later in her career the school principal. She is excited to be here at Holy Name of Jesus Catholic School, her new home. Mrs. Falk’s Bachelor’s Degree was conferred by Saint Francis University on Loretto, Pennsylvania with a Major in Political Science. Later she went on to obtain her Florida Teacher Certificate and then continued her education at the University of North Florida that granting her a Masters in Educational Leadership. We are incredibly proud to share over 50 years of a community of faith, family and friends!